According to a recent press release, The Hong Kong Polytechnic University (PolyU) and Sun Yat-sen University (SYSU) held an agreement signing ceremony recently to further their collaboration in areas of space science and technology, marine science and technology, tourism management research as well as innovation and entrepreneurship. The signing ceremony was held in the Zhuhai campus of Sun Yat-sen University. The PolyU President and the SYSU President signed the agreement on behalf of the two parties. The PolyU President stated in his speech that PolyU has state-of-the-art technology in space technology. PolyU was recently funded by the Mainland’s China Academy of Space Technology to participate in the study of the debut landing region on the far side of the moon for spacecraft Chang’e-4. This was covered earlier by an OpenGov Asia report, wherein it was noted that PolyU’s tech contributions to the lunar probe would include the design and development of an advanced Camera Pointing System, and an innovative lunar topographic mapping and geomorphological analysis technique in landing site characterisation for the spacecraft. Chang’e-4 is the first lunar mission in the world to land on the far side of the Moon. The selection of a safe landing site with scientific value for Chang’e 4 is, therefore, one of the major tasks for the exploration. It was also noted that the PolyU team has been working on the project since March 2016 and has amassed a large amount of lunar remote sensing data from multi-sources to create high-precision and high-resolution topographic models at the north-western South Pole – Aitken basin on the far side of the Moon, a potential landing region for the Chang’e-4. The team then analysed in detail the terrain slopes, terrain occlusions to sun illumination and telecommunication, crater distribution, rock abundances, and geological history of the region. These analyses helped the team to put forward a sound and evidenced-based proposal of possible landing sites. In his speech at the signing, the PolyU president also noted that the university has also designed and manufactured the “Camera Pointing System” for the nation’s lunar exploration projects. He stated the two universities jointly organise a doctoral programme to nurture talents for the Greater Bay Area development. 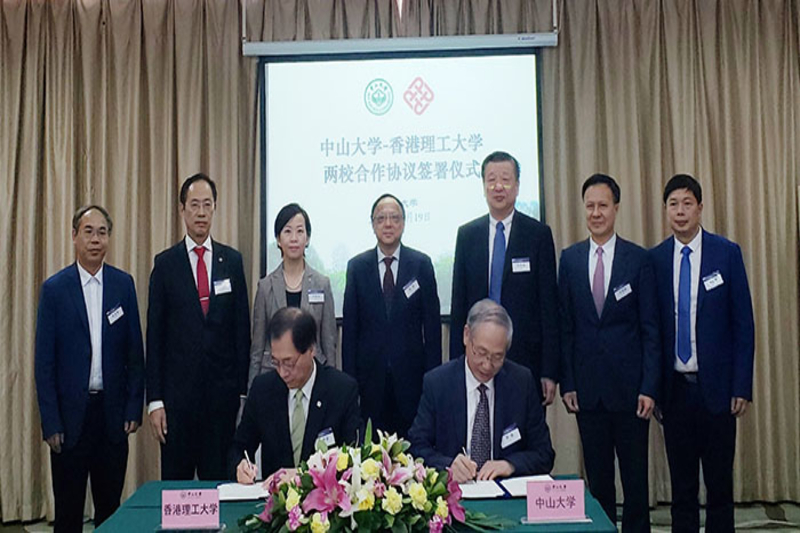 The recent establishment of the ‘Greater Bay Area Biotechnology and Translational Medicine International Collaboration’ marked another significant milestone in the close-tie cooperation between the two academic institutions. The signing of the collaborative agreement this time will bolster support for the nation’s development strategy and meet the societal needs in the development of the Greater Bay Area. On the same day, the PolyU delegation also participated in the inaugural ceremony of the Guangdong-Hong Kong-Macau Space Science and Technology Alliance and the Guangdong-Hong Kong-Macau Ocean Technology Innovation Alliance held at Sun Yat-sen University. The forming of the Alliance is an important imitative for the universities in the three cities to harness the growing momentum of the nation’s development and provide a robust talent pool and strong technical support for the national strategic development in areas of space and ocean. The Deputy Mayor of Zhuhai Municipal People’s Government also witnessed the signing ceremony.